Calorie Restriction with Optimum Nutrition (CRON) - The Longevity Diet. Calorie Restriction (CR) is a diet in which calorie intake is reduced, compared to diets that do not limit consumption. Calorie Restriction with Optimum Nutrition (CRON), also called the Longevity Diet, has the potential to increase the average and maximum life span. CR is best characterized as undernutrition without malnutrition. Optimum Nutrition consists of eating the right amounts of nutrients on a proper schedule to achieve the best performance and the longest possible lifetime in good health. A person born in the United States at the beginning of the 20th century could expect to live to an age of 49 years. At the end of the 20th century, life expectancy had increased to 77 years. This increase of 57 percent was the result of improvements in public health, medicine, and nutrition. Similar improvements have been achieved throughout the world by the eradication and control of infectious diseases and advances in agriculture. However, the maximum life span of humans has not changed substantially. Only 1 in 10,000 people in developed countries can expect to live to 100 years of age. The risk of heart disease, cancer, stroke, and diabetes can be reduced substantially by eating nutritious natural foods, maintaining a normal weight, exercising regularly, and not smoking. The chance of death can also be decreased by avoiding drugs, alcohol abuse, pollution, violence, and wars. At the same time, it is important to practice good hygiene, get competent medical care, get protective vaccinations, and avoid risky behavior that can result in accidents or infection with the viruses that cause AIDS or hepatitis. The life-extending effect of reduced calorie diets was reported in 1935 along with the observation that CR stunted body size. Since then, CR has been proven to extend the average and maximum life span for many species including yeasts, worms, mice, rats, etc. Animal experiments on calorie restriction after maturity indicate that adult-onset CR also increases longevity. Experimental animals have the advantage that they are kept in sanitary cages, given regular meals, and not subjected to stress, infectious diseases, accidents, and predation that would reduce their life span in the wild. Many mechanisms have been proposed to try to explain why CR increases life span. Studies at the molecular level have shown that several genes in the sirtuin class, including SIRT1, SIRT3, and SIRT4, create enzymes that increase the activity of the mitochondria and slow the cell's aging process. Many years of study and experimentation will be required to elucidate the complex molecular processes that result in longevity and, also perhaps, to develop nutritional supplements that extend lifespan without having to suffer the rigors of hunger. There has not been sufficient research to determine if humans on calorie restricted diets will live longer, but preliminary observations of the physiological changes caused by CR indicate that life-extending effects will probably be observable in humans also. However, a 25-year study in rhesus monkeys by the National Institute on Aging (NIA)  suggests that genetics and dietary composition matter more for longevity than the degree of calorie restriction for primates. The NIA study found that the monkeys on the lower calorie diet did not live longer, but had less incidence of cancer. The graph above shows that the longevity of mice increases as the percentage of calorie restriction increases, but this is not a never-ending process. At higher levels of calorie restriction, life is not physiologically possible. The only outcome is death by starvation. One remarkable feature of CR is that the growth of the experimental animals is stunted significantly by the low-calorie diets. Typically, mice are started on calorically restricted diets after 9 weeks, shortly after weaning. The mice on 40% calorie restricted diets grow to be adults which are approximately 51% of the size of mice fed ad libitum. 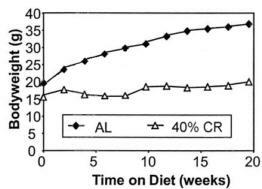 Masoro also reported that rats started on a 40% CR diet at 6 weeks of age had lower weights. Masoro's data for rats from 10 to 20 months old can be used to calculate that the 40% CR rats had only 53% of the weight of the AL rats. Body weights of male C57BL/6 mice. 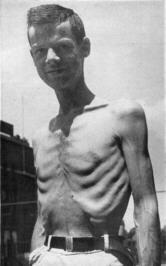 There are some ethical problems in applying calorie restriction protocols to humans because food restriction has been used as a punishment throughout history and food deprivation associated with famines and concentration camps evokes very negative images. To emulate the mice experiments, calorie restriction of humans would need to start around 2 or 3 years of age and provide all necessary nutrients. A fully-grown human adult raised on a 40% calorie restricted diet would weigh 75 pounds instead the normal 150 pounds. Presumably such humans could live to an age of 120 years under ideal conditions, but their small size, equivalent to that of a 10-year-old child, would be a serious social disadvantage in any confrontation or competition requiring physical strength and stamina. It is not known whether smaller humans with smaller brains would have the same mental faculties or be as intelligent as their bigger counterparts, and there are also unanswered questions about various aspects of reproduction. How do you measure Calorie Restriction? In animal experiments, calorie restriction is measured as a percentage of food given to an experimental group compared to the amount of food eaten by a control group that eats without restriction or ad libitum (AL). Scientists divide a set of genetically homogeneous animals into an experimental group and a control group. They measure how much a control group eats, and then use that amount as the basis for determining how much to feed the experimental CR group, e.g., 30% less, etc. This method cannot be used for humans because genetically homogeneous controls are not available. The use of a "set point" as a reference point for CR has been suggested by several writers. The set point is supposedly the weight that the body tends to keep despite variability in calorie consumption. Unfortunately, this concept is fairly useless because there is no practical way of determining such a point. The book by McGlothin and Averill provides a practical way of quantifying calorie restriction by using as reference a table from the Institute of Medicine with the average calorie ranges for persons of various ages and activity levels. Ideally, CR should be started after the body has matured and stopped growing because low calorie diets may stunt growth even when the diet contains all essential nutrients. It is also not advisable to practice CR during pregnancy or illness, as at these times the body needs adequate nutrition for the proper formation of a fetus or to fight disease. Consult a physician and make sure that you are healthy before starting CR. You should not attempt a calorie restriction diet without the aid of nutritional tracking software, a good understanding of nutrition, and competent medical supervision. The caloric needs of a person are determined by the Basal Metabolic Rate (BMR), which is the energy needed for normal metabolic activities such as breathing, digestion, maintaining body temperature, etc., plus the energy required for physical activities. Moderate physical activity can burn from 150 to 400 calories per hour, depending on the type of exercise, body size, and the duration and intensity of the exercise. A very physically active life style consumes many calories and is generally incompatible with calorie restriction. The only energy available to the body is the energy in the food minus the energy excreted as waste . Excess energy not burned as exercise or for basal metabolism will be stored as extra weight (fat, glycogen, muscle, etc). A deficit of food energy will result in loss of weight as the body tissues are consumed to meet energy needs. Habitual eating patterns affect BMR. Long-term calorie restriction decreases BMR, whereas frequent overeating increases BMR [8, 10]. Extrapolating from the mice survival graph, a person wanting to live to 120 years of age might be tempted to adopt a 40% CR diet. However, the degree of restriction giving the greatest longevity depends on the age at which it is started . Higher restriction started late in life is associated with greater mortality rather than with longer life. Adult-onset CR works best when it is imposed slowly to allow the body to adjust. In general, the later in life that CR is started, the less restriction that should be practiced, and the calories should be reduced gradually during a period of two or three years, rather than suddenly. The amount of food that can be consumed has two extremes: 1) low enough to cause death from starvation, and 2) high enough to lead to obesity. The amount of food associated with the longest life span is somewhere between these extremes. The chances of survival are increased just by maintaining a lean body. Experiments with rhesus monkeys have shown that those restricted to keep their body fat at approximately 17 to 24 percent had a 2.6 lower risk of death than non-restricted monkeys. The stunting in body size of life-long CR provides some insights about the maximum amount of CR that should be practiced after maturity. Knowing that a 40% CR diet can only sustain a body approximately 50% of the normal size, it is reasonable to suppose that 40% CR would not provide sufficient nutrition for a fully-grown normal body size. Unfortunately, there have been no experiments where growth-stunted mature mice raised on 40% CR are switched over to an ad libitum diet to find out how much they are able to eat. Due to their smaller size, the CR mice would not be able to eat as much food as the normal size mice, and this experiment would provide their actual degree of restriction relative to their smaller body weight. This amount of restriction would be a better guide for CR started after maturity. A six-month semistarvation study by Keys performed on human volunteers showed that severe energy restriction decreased BMR in absolute terms by 39% and also relative to the weight of metabolically active tissue by 16%. The degree to which the body can adjust metabolic rate may be used as a guideline for determining the maximum safe percentage of restriction. If you feed your body less than the amount to which it can adjust, the body will try to compensate by reducing fat, muscle, or bone mass. Death by starvation will result if the body cannot adjust to a lower calorie intake. Considering that 16% is the maximum reduction in BMR for metabolically active tissues obtained by starvation diets, then a CR diet not exceeding 16% could be considered safe because the metabolism can adjust to the lower calorie intake without causing structural damage to the body. Keys' experiment was carried out with lean subjects, so the reference point for computing 16% CR should be a weight corresponding to a BMI of around 22. The fact that higher CR rates in experimental animals result in longer lifespans suggests that a lower metabolic rate, which reaches a limit at approximately 16% below the normal rate, may not be the only factor involved in longevity. There is some evidence that 15% CR may be optimum for longevity in humans and that higher restriction is detrimental. A study of 1915 healthy nonsmoking Japanese-American men who were followed for 36 years found that those who consumed 15% fewer calories than the group mean were at the lowest risk for all-cause mortality. Increased mortality was seen with intakes below 50% of the group mean. As the calories in the diet are reduced, it is necessary to assure that the food contains all the necessary nutrients in the proportions needed by the body and that the body is able to utilize the nutrients provided. It is possible to use computer programs to create menus containing all known necessary nutrients, but since individual needs may differ, it is better to be cautious by not restricting calories excessively. High degrees of CR have the potential of damaging health even if nutrition is optimal. The consequences of a deficiency may not be seen immediately, but may become evident later in the form of osteoporosis, decreased libido, depression, or premature death. The amount of food consumed and the level of exercise are the two components of the diet equation that can be controlled significantly. BMR and the amount of waste cannot be altered substantially, but people with eating disorders, e.g., bulimia, use laxatives and vomiting as a way to increase the amount of waste. The number of calories burned through exercise varies according to the type of exercise and the weight of the subject. Typically, moderate exercise can burn approximately 300 calories per hour. The energy deficit in the semistarvation study by Keys was achieved by feeding the volunteers 1800 calories, but by making them expend about 3000 calories through exercise and work. In general, people who exercise regularly have a lower death rate than sedentary people, regardless of their weight. Research on mice has shown that the beneficial effects of food restriction and exercise on survival are not additive or synergistic. Since exercise requires additional caloric intake, long periods of exercise are considered to be counterproductive toward the goal of reducing calories, and many CR practitioners exercise only moderately or not at all. Exercise is important during the initial implementation of a calorie restriction program, as it has been found that bone density is reduced by weight loss induced by calorie restriction, but not by exercise-induced weight loss. Also, CR in combination with exercise preserves relatively more lean mass than CR only. The food that you eat should have the proper proportion of nutrients for your current stage of life. A woman of reproductive age, for example, needs more iron than a post-menopausal woman. Optimum Nutrition should provide the right quantities of protein, fat, carbohydrates, vitamins, minerals, fiber, and probiotic bacteria to maintain a healthy body and to sustain the desired level of activity for the best quality of life. The U.S. Government Recommended Diet of 2000 calories per day, which is used as reference in nutrition labels, consists of 15% protein, 30% fat, and 55% carbohydrate. This proportion of macronutrients has been blamed for the obesity epidemic in the U.S. because of its high carbohydrate content. CR diets try to select nutrient-dense, low-calorie foods to provide the necessary protein and essential fats while reducing the amount of carbohydrates and saturated fats. These selections tend to shift the macronutrient ratio toward 30% protein, 30% fat, and 40% carbohydrate, which are the ratios in Dr. Sears' Zone Diet. There is no general agreement in the CR community about the proportion of protein in the diet, although the recommendation of the Institute of Medicine of 0.8 grams of protein per kilogram of body weight is regarded as the minimum protein consumption. Some CR practitioners try to get their protein from vegetable sources to reduce the amount of the amino acid methionine, because methionine restriction has been found to extend life in some animal experiments. Metabolism research has found that the ingestion of protein produces higher levels of Insulin-like Growth Factor 1 (IGF-1), a hormone that plays a role in growth and muscle-building. However, several studies have shown that higher levels of IGF-1 are associated with an increased risk of cancer. For this reason, many CR practitioners limit their protein to the minimum recommended by the Institute of Medicine to maintain their IGF-1 levels as low as possible. The experimental low-protein CR diet has had the unforeseen consequence of producing impaired glucose tolerance (IGT) when the subjects are given an oral glucose tolerance test (OGTT). It is not clear at this point whether the impaired ability to metabolize glucose is due to the lower IGF-1 levels, or because the beta-cells in the pancreas cannot survive or produce sufficient insulin with the low protein diet. When eating fewer calories, it is very easy to develop nutritional deficiencies, particularly if the diet does not rely on a wide variety of foods that provide trace nutrients that are important for life, but whose importance has not been scientifically determined yet. The biochemical machinery of the body is very complex. Some diseases, such as osteoporosis, may be caused by a deficiency of any of the many components required to build bone. Bone consists of a collagen matrix made from protein with crystals of calcium phosphate and several other trace minerals. Vitamin D is required for bone development. CR diets must contain the appropriate amounts of Vitamin D, calcium, phosphorus, protein, and trace minerals to maintain healthy bones. It is essential to use software for nutritional analysis to verify that your diet meets all the Recommended Dietary Allowance (RDA) for protein, vitamins, minerals, and essential fatty acids. People who for ethical or philosophical convictions do not eat animal products (vegans) may need dietary supplements to avoid vitamin deficiencies. People who track their nutrition carefully are aware that it is possible to get all the necessary nutrients from food on a calorie restricted diet without taking dietary supplements. Some research on longevity provides the hope that, in the future, it will be possible to extend lifespan without restricting calories. In 2003, a study found that resveratrol, a polyphenolic compound found in grapes and red wine, significantly extended the lifespan of yeast. Resveratrol was later found to increase the lifespans of worms, fruit flies, fish, and mice fed high-calorie diets. It is not known whether resveratrol will have similar effects in humans. One of the leading theories of aging, the glycemic theory, states that excess glucose leads to pathological changes by binding with proteins and creating advanced glycation end-products (AGEs). This has motivated many practitioners of CR to prevent their glucose from rising excessively after eating. Some do this by eating small meals frequently, a technique called "grazing", and by increasing their intake of fiber to slow the absorption of carbohydrates from the intestine. Others do it by changing the ratios of macronutrients so that they get approximately 60% of their calories from fat and a small number of calories from carbohydrates. This way of eating avoids the consumption of large quantities of food at one time that would normally result in elevated blood glucose levels. However, recent research on eating only every other day, called "Intermittent Fasting", has shown beneficial effects that met or exceeded those of calorie restriction including reduced serum glucose and insulin levels. One important aspect of intermittent fasting is that it does not require calorie restriction on the non-fasting days and does not cause stunted growth. With regard to longevity, it is still too early to know whether it is better to eat all your calories in small quantities throughout the day, once a day, or every other day. Is there an Ideal Weight for Longevity? It is well known that obesity increases the likelihood of diabetes, cancer, and cardiovascular disease which can shorten life. Similarly, being very thin reduces the reserves needed for the body to survive periods of stress or illness. The Department of Epidemiology and Surveillance Research of the American Cancer Society conducted a prospective study of more than 1 million adult men and women in the United States who had never smoked. Over 200,000 deaths occurred during 14 years of follow-up. The nadir (minimum point) of the curve for Body Mass Index and mortality was found at a BMI of 23.5 to 24.9 in men and 22.0 to 23.4 in women. This is in the upper half of the normal BMI range of 18.5 to 24.9. These results have been regarded with skepticism by CRON practitioners who follow Dr. Walford's recommendation of losing weight until a BMI of less than 20 is reached. [3, p.228] A more recent study based on 99,253 male physicians found that those with a BMI less than 20 had a 12% lower relative risk of death when compared to men with BMI from 22.5 to 24.9, and higher BMIs were associated with an increased relative risk of mortality. Another large prospective study of 894,576 participants found the optimum BMI for longevity to be from 22.5 to 25. Evaluation of studies published in peer-reviewed journals during the last 40 years has led Dr. Luigi Fontana to conclude that CR may be harmful for lean persons who have minimal amounts of body fat. The rate of suicide has been found to be greater for men with BMIs below 21 than for men with higher BMIs, and analyses of mental health-related quality of life also showed a positive relationship with increasing BMI. The optimal BMI for longevity and mental health will continue to be debated for some time, but it is clear that being overweight or obese shortens lifespan. The most important thing that we can learn from people who have actually lived 100 years is that we should avoid gaining weight as we age. This requires decreasing the number of calories over time to compensate for the reduction of Basal Metabolic Rate that is associated with aging. A study of the lifestyle of centenarians found that they maintained a normal body weight without excessive variations throughout their life and that they consumed a variable and balanced diet. Another study of 13,451 participants averaging 73 years of age which were followed-up for 23 years found that being underweight or overweight was associated with increased mortality. There is a general assumption that advice regarding weight control through lifestyle modification applies also to older people, but recent studies show that the BMI values associated with optimal health outcomes for seniors may differ from the general adult population. A study of behavioral risk factors on death within 10 years for 7,438 Australian women and 6,053 men aged 71–79 found that being overweight (BMI 25 to 29.9) conferred the lowest risk compared with being obese (BMI 30 or more) or having normal weight (BMI 18.5 to 24.9). This is one of a growing number of studies that suggest that, for older people, BMI values associated with optimal health outcomes may differ from the general adult population. Another 10-year follow up study of people aged 70 and over confirmed these findings. A group of 4,677 men and 4,563 women aged 70–75 in Australia showed the lowest mortality risk in the overweight group, suggesting that current BMI thresholds may be too restrictive for older people. This is of vital importance, since following general guidelines, many older people may be advised to lose weight inappropriately and have adverse health consequences. What is the difference between Calorie Restriction and Anorexia? The motivation for CR is longevity, health, and delaying the onset of disease. People who practice calorie restriction monitor their food intake to ensure that they are getting all the vitamins and nutrients they need with the minimum number of calories to maintain their weight within the normal BMI range of 18.5 to 24.9. The most aggressive CR practitioners try to keep their weight in the lower half of the normal range. It is common to have medical exams and blood tests at least once per year and to monitor weight on an accurate bathroom scale at least weekly. Food is weighed or measured, and the nutritional content of the food is tracked using software programs that help to identify potential dietary deficiencies so that they can be corrected. Anorexia nervosa is an eating disorder characterized by low body weight and an obsessive fear of gaining weight. People diagnosed with anorexia have a psychological urge to be thin and use only the mirror or the opinions of others as a guide to their eating habits. Anorexics do not understand their nutritional needs and do not have objective criteria for achieving a specific body weight target. Anorexics usually have BMIs below 17.5 and never think that they are thin enough. Anorexics perceive eating as a weakness that makes them fail at their attempts to be thin. Anorexics care about losing weight by any means possible including excessive exercise, diet pills, laxatives, purging, and restriction of food without regard to nutrition. These practices often lead to suppression of menstrual periods, muscle spasms from electrolyte imbalances caused by repeated vomiting or use of laxatives, and osteoporosis caused by calcium and vitamin D deficiency. Restriction of essential fats and low body fat levels often lead to mental and cognitive problems. Anorexics generally suffer from malnutrition and die early. Anorexia nervosa has the highest death rate of any psychiatric disorder. Without treatment, one out of ten persons with anorexia nervosa dies from starvation, kidney failure, cardiac arrest, medical complications, or suicide. Calorie Restriction is an experimental procedure that should be implemented gradually. Reducing caloric intake quickly does not allow the metabolism to adjust to the caloric deficit. Sudden calorie restriction can create major health problems. In particular, persons who have a Body Mass Index (BMI) below 22 should be very cautious. Calories should be reduced by less than 5% (less than 100 calories) and maintained for at least four weeks before any additional reductions are made. Weight should be monitored daily, and nutrition should be tracked with software like CRON-o-Meter to make sure that the diet provides 100% RDA of all vitamins and minerals, at least 1 gram of protein per kilogram of body weight, and sufficient amounts of essential omega-3 and omega-6 fatty acids. You should not restrict calories further if your BMI is below 19. On the contrary, you may need to increase your caloric intake to maintain your BMI within the normal range (from 18.5 to 24.9). Use the Calorie Restriction Calculator to determine your Percent Caloric Restriction (%CR). Do not exceed 16% CR since greater restriction can result in loss of structural tissue, including bones and muscles. How to start calorie restriction. Download CRON-o-Meter (//cronometer.com/download/). This is a free nutrition-tracking program that will help you to analyze your food so that you can learn to optimize what you eat. You don't have to start a diet, but you have to start measuring and weighing what you eat. In this way, you will learn how many calories you are now consuming on a daily basis, and you will also get a summary of your macronutrient ratios. The program will also point out any nutritional deficiencies. Join the CR Society International. This will give you access to support from many members who can answer your specific questions. Once you are familiar with measuring your food and optimum nutrition, you can gradually reduce your calories. This analysis introduces the concept of "metabolic capacity" to make sense of the paradoxical fact that rodents receiving a calorie restricted diet live longer while eating more food in proportion to their weight than the control animals. It can be shown that if the metabolic capacity decreases at a slower rate than the weight loss caused by a diet, the restricted animals will always have a caloric deficit called the "real rate of restriction". Mice put on a 40% calorie restricted (CR) diet after 9 weeks of age have an adult body weight that is 51% of the weight of mice fed ad libitum (AL). Considering that CR mice receive 60% of the food eaten by AL mice, CR mice eat 18% more than AL mice on a body weight basis: If the AL mice get F grams of food for a body weight of W, the CR mice get 0.6 F grams of food for a body weight of 0.51 W. Dividing 0.6 F by 0.51 W gives 1.18 food/weight for the CR mice, which is 18% more food. How can this information be reconciled with the fact that the degree of caloric restriction, within physiological limits, increases maximum life span proportionally? Obviously, even if the CR mice are eating relatively more food than AL mice, they are not eating as much as they need, otherwise there would be no CR longevity effect. How can we calculate the caloric deficit? The CR/2 term in the expression was chosen to fit the data from Mattson. The formula may need to be adjusted for other degrees of caloric restriction. CRW = ALW when CR is zero, which is what we would expect. For mice on a 40% CR diet, MC = 0.6×1.2 = 0.72. This can be interpreted as meaning that the adult 40% CR mice are getting 60% of the food of AL mice, but that ad libitum they might consume 72% of the food of AL mice. This would need to be verified by an experiment where mice on a 40% CR diet, once having reached maturity and their maximum 50% size, would be allowed to eat ad libitum, and their consumption monitored. Do these mature, small mice eat 72% of the food that AL mice eat? The results would allow modifying the CR/2 term, as necessary. Note that if CR is zero, MC = 1, as it should be. Although the 40% CR mice eat 18% more than AL mice on a body weight basis, the real rate of restriction relative to their Metabolic Capacity is 16.7%. For non-restricted mice, RRR is zero since MC = 1 and CR = 0. These quantitative results depend on the equation defining Metabolic Capacity. It seems reasonable to expect that a restricted animal will always be able to eat more than what it had been fed to reach its adult size, but less than what a full size mature animal raised ad libitum can eat. When this information becomes available from experimental data, it will be possible to replace the approximations presented here with calculations based on actual data. Applying the Mifflin-St Jeor energy expenditure equations to human data we can find some correlation with the mouse data. Given a 5-foot, 8-inch (1.73 m) 35-year-old human male with a BMI of 22.0 (144.4 pounds, 65.5 kg), the Basal Metabolic Rate (BMR) is 1565 Calories, and 2153 Calories if lightly active. A person of half the weight (72.2 pound, 32.8 kg) and a height of 4 feet, 0 inches (1.22 m), also corresponding to a BMI of 22.0, would have a BMR of 919 Calories, and 1263 calories if lightly active. Notice that the caloric requirements for a person of half the weight are not half of the requirements of the full-grown person, but rather 59 percent, which corresponds to a 40% CR diet. This is in agreement with the results observed in the mouse data. The objective of Calorie Restriction with Optimum Nutrition is to increase life span in good health. There are some members of the Calorie Restriction Society who have restricted their caloric content in adulthood by 30 to 40 percent. This may be an excessive amount of restriction to support a fully-grown body frame. The experience of these dedicated volunteers will eventually provide data to determine the maximum levels of calorie restriction that actually result in longevity rather than in malnutrition or early death. Definitive answers about the proper practice of CRON for humans may not be available until the end of the 21st century. The CR Society International provides forums where members can exchange information about their practice of CR. There are also web sites such as NutritionData and FitDay that provide many useful tools for planning diets and for tracking daily nutritional intakes. A free, open-source, Java-based desktop program called CRON-o-meter is also available. JMcCay CM, Crowell MF, Maynard LA. The effect of retarded growth upon the length of life span and upon the ultimate body size. Journal of Nutrition 1935, 10:63-79. Roy Walford, M.D., "Beyond the 120 Year Diet: How to Double Your Vital Years ", 2000. Mattson, et al. "Intermittent fasting dissociates beneficial effects of dietary restriction on glucose metabolism and neuronal resistance to injury from calorie intake, Proc Natl Acad Sci USA, 2003 May 13; 100(10):6216-6220. Ross MH., Length of life and caloric intake. Am J Clin Nutr. 1972 Aug;25(8):834-8. D.A.T. Southgate, A.R.C. Food Research Institute, Norwich, UK (October 1981). THE RELATIONSHIP BETWEEN FOOD COMPOSITION AND AVAILABLE ENERGY. Provisional Agenda Item 4.1.3, Joint FAO/WHO/UNU Expert Consultation on Energy and Protein Requirements, Rome, 5 to 17 October 1981. Holloszy JO, Mortality rate and longevity of food-restricted exercising male rats: a reevaluation. J Appl Physiol. 82:399-403, 1997. It is concluded that 1) moderate caloric restriction combined with exercise does not normally increase the early mortality rate in male rats, 2) exercise does not interfere with the extension of maximal life span by food restriction, and 3) the beneficial effects of food restriction and exercise on survival are not additive or synergistic. Luigi Fontana, MD, PhD; Samuel Klein, MD, "Aging, Adiposity, and Calorie Restriction", JAMA. 2007;297:986-994. Body Mass Index and Risk of Suicide Among Men Kenneth J. Mukamal; Ichiro Kawachi; Matthew Miller; Eric B. Rimm Arch Intern Med. 2007;167:468-475. "After adjustment for age and other confounders, there was a trend toward lower mortality in the second quintile of energy intake, suggesting that men who consumed 15% below the group mean were at the lowest risk for all-cause mortality. Increased mortality was seen with intakes below 50% of group mean." GNN - Eat Less, Live Longer? Are you new to healthy life extension? Click here to find out more about living a longer, healthier life. Information on extending lifespan by restricting calorie intake. You know that decreasing your calories will increase your lifespan, but adding fish oils to that regimen will have a profoundly synergistic influence.